Open up the Display panel to change how the loaded polymesh is displayed. Switch between Perspective and Orthographic projection. Select the "Up" axis for the loaded mesh. By default its Z-up, which is standard among CAD applications, but many popular animation programs use Y-up. So if you load your mesh and its lying on its side, try the Y-up or X-up options to get it up the right way. The Free option turns on free rotation; UVLayout won't try and keep the object upright, and so you can tumble the view beyond the normal camera lock points. Move the slider to move the light source from right to left. Click the gray Light button to cycle between four different levels of ambient lighting, from none to full and a couple of levels in between. The default is a small amount of ambient lighting. Move the slider to the left to make the mesh more and more transparent. You can use this see, and pick, obscured edges that might be hard to access normally. Switch between UV edit, 3D edit and 3D textured views. Use the ? hotkey to find out what other hotkeys are available in each mode. Switch between "flattening error" and 4/5 keys or Local "rescale" coloring of polys when in the UV view. Click the Trace button to load an image in the background when editing UVs. Use the first slider to fade the background in and out, and the second slider to change the transparency of the flattened geometry. The loaded image will also display mapped onto the mesh in the 3D view as one of the T hotkey texture cycles. Click Trace a second time to turn the background image off. Alternatively, if want to show the standard checker patterns in the UV editing background, also click the Trace button but then click the red Dismiss button in the file selection window. This will turn that feature on, and the sliders can be used to adjust the transparencies. Click Trace again to turn the checker pattern background off. When turned off, UVs are linearly subdivided when SUBD surfaces are displayed in smooth shading mode. When turned on, UVs are smoothly subdivided; this is equivalent to Renderman's Smooth UVs option (hard boundary, smooth interior). This toggle only applies to the display of textures, and doesn't affect the flattening in any way. Ticking this will draw ghost copies of the visible shells into surrounding tiles. It will also change the behavior of the Render tool, outputting just the single 0 to 1 tile, but wrapping the graphics around for shells that extend beyond that tile. And finally the tile coverage feedback operates in the same way, showing the stats for just the 0 to 1 tile, but accounting for shells that wrap around. When shading the mesh with the T hotkey texturing, use average smooth normals, or normals imported from the OBJ file (if any are defined). Ticking either of these will display the tile numbers in the UV view. Type a Udim value or U and V value here, followed by the Enter key, and the view will zoom to that tile. These last settings are effectively Display preferences, as they are remembered between UVLayout sessions. 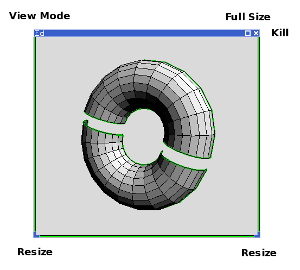 Shows the polygon outlines when the mesh is drawn in the T hotkey textured 3D views. Hides the green UV seam lines when the mesh is drawn in the 3D view. Hides backfacing polys from the 3D views. For example, if you are editing a scene that consists of geometry inside a closed room, ticking this option will allow you to see the internal geometry easily (i.e. the front walls will be hidden). Fade out then hide the wire lines for very short edges. Especially useful when editing dense meshes, as it allows you to see more clearly the color feedback shading on polygons. If you move the camera in an Ed or 3D view, then all other cameras to these spaces will move as well. When you first start UVLayout, you only see one view at a time of the loaded object in the display window. You can quickly switch between the UV, Ed and 3D views with the 1, 2 and 3 hotkeys, but if you prefer to see multiple views at one, you can create multiple panes inside that one window. This splits the current pane into two. If you only have the single view window up, it'll create two equal sized panes within that space. Initially the newly split panes have the exact same view, but you can use the 1, 2 or 3 hotkey at any time to change a pane's view mode. The view mode of each pane is shown in the title bar. You can kill individual panes by clicking on the X at the top right of the pane frame, but if you want to get rid of them all at once, click this button. It will take you back to the default single view window. To move a pane within the window, LMB click'n'drag any part of the pane frame or title bar. To resize a pane, LMB click'n'drag either of the bottom left or right corners. To make a pane temporarily full size, click the square icon towards the top right of the pane frame. If you have an arrangement of panes that you would like to use every time you run UVLayout, click the grey "pin" button to the left of the main GUI window About UVLayout button. This will save the pane positions and view modes, any they will be restored whenever you load a new object into UVLayout.